Great Position Ground floor shop with own Security car space. Total of 88sqm including car space and storage. Footsteps to railway station, buses and schools. Build approx. 2014 Ducted ventilation with Reverse cycle air conditioning Available vacant possession or subject to tenancy. Amazing opportunity whether it be for investment, or future business. Suitable for many retail uses. Gunning Real Estate is delighted to present to the market for sale by private treaty, this rare CBD retail investment, located at shop2/60 Park Street, Sydney. The property is prominently located on the corner of Elizabeth and Park streets, directly opposite Hyde Park and within very close proximity to the new Sydney Metro and Town Hall Stations. Investment Highlights; Leased to "Cup N' Chino" espresso bar New three (3) year lease plus options to 2027 Net income of $85,644.72 Strong 4% annual increases 41sqm shop plus 14 sqm storage (55sqm total strata area) Well established business usage Rare Sydney CBD strata retail opportunity Please contact the sales agents for a comprehensive Information Memorandum and contract of sale. 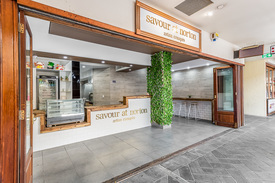 Food Operators Buy In Belmore Now! OPEN YOUR FOOD BUSINESS H..
Just 250 metres from Newtown Station. Modern retail premises with large window shop front, secure parking and storage. Features floorboards and downlights. Situated in the heart of Newtown on King Street next to The School of Performing Arts. Features: Frontage 6m Retail floor space 68.5 sqm Ducted ventilation Reverse cycle air conditioning Storage/WC 6.8sqm Security car space 14 sqm Suitable for many retail uses. Available vacant possession or subject to tenancy. Some of the display cabinets can be included upon negotiation. Council Rates: $187 pq Water Rates: $180 pq Strata Rates: $965 pq Shop Size: 68.5 sqm Total Size: 84 sqm Figures are approximate only. Lot 57, a 12m2 kiosk is perfectly positioned at the south corner of the beautifully presented gallery and next to the escalator. Its prominent position attracts great foot traffic and shopper's interest. 12m2, currently vacant Provisioned for water supply Suitable for snack bar, cafe and general retail Mins walk to redeveloped Darling Harbour, World Square, Town Hall Great investment potential Number 1 Dixon Street Shopping Centre, the gateway to the heart of Sydney's tourist mecca, Chinatown, occupies a prime block bounded by Dixon, Goulburn, Harbour and Liverpool Streets with main entry located along Dixon Street. It's the home to a number of trendy and gourmet Asian cuisines and also congregates boutique fashion outlets, gift, accessories, snack bars and entertaining venues. Number one Dixon Street is conveniently positioned between the intersections of Liverpool and Goulburn Streets. This prime location is handy to all modes of public transport including Town Hall, Central Station and Darling Harbour. The retail space is located on level 5, 69sqm, vacant possession. It is suited for all types of retail operations. Number one Dixon Street is conveniently positioned between the intersections of Liverpool and Goulburn Streets. This prime location is handy to all modes of public transport including Town Hall, Central Station and Darling Harbour. The subject retail investment property is situated in the popular 'Number One Dixon Shopping Centre' and is located on level 2 . Has three lots combined together and has been leased to a entertainment business with a gross rent $288,943. Shop 25 is perfectly situated along the beautifully presented gallery with wide glass windows. Its prominent position attracts great foot traffic and shopper's interest. Currently leased to a fashion and accessory retailer. 28m2 Lease expires in Dec 2017 with one year option Current net passing rent, $36,600 Mins walk to redeveloped Darling Harbour, World Square, Town Hall Great investment potential Number 1 Dixon Street Shopping Centre, the gateway to the heart of Sydney's tourist mecca, Chinatown, occupies a prime block bounded by Dixon, Goulburn, Harbour and Liverpool Streets with main entry located along Dixon Street. It's the home to a number of trendy and gourmet Asian cuisines and also congregates boutique fashion outlets, gift, accessories, snack bars and entertaining venues. On offer is arguably the best industrial building in Belmore's industrial 'pocket'. Consisting of two separate architecturally designed industrial buildings , the construction of these structures is solid as a diamond , yet versatile enough to accommodate a vast range of uses. Front building Features: 860 sq.m. Of space over two levels with steel reinforced concrete slabs to sustain heavy loads . State of the art first level offices / meeting rooms / amenities Separate room for storage of hazardous material Two high clearance container access roller doors ( 7m approx) 5 carspaces Rear building features: As new factory / warehouse facility in popular Belmore industrial precinct. With a total area of 650m² over two levels, a combined clearance of over 7 meters and steel reinforced concreted slabs to sustain extra heavy loads, this property offers numerous options. The building is split into two distinct warehouses allowing the option to occupy both sections or just simply occupy one section and rent out the rest with an attractive rent return. Suitable for a variety of uses (light manufacturing, warehousing/distribution etc) the property is strategically located within close vicinity to major arterial roads and M5. Inspection is highly recommended! Number one Dixon Street is conveniently positioned between the intersections of Liverpool and Goulburn Streets. This prime location is handy to all modes of public transport including Town Hall, Central Station and Darling Harbour. The subject retail investment property is situated in the popular 'Number One Dixon Shopping Centre' and is located on level 2 . Has been leased to a fashion retailer with the lease expiring at Dec 14, 2018 plus two years option to renew. Gross $49,858 per annum. 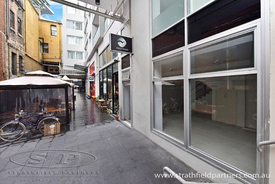 Retail Investment Property for sale in Sydney CBD The Number One Dixon Shopping Centre is renowned for food, fun and fashion and late night trading conditions are also available to capitalise on the strong retail demand outside of normal business hours. The complex comprises a six level retail plaza with parking available via Harbour Street. The retail premises has been leased to a food retailer. Net lettable area 328 sqm Contain 4 lots Net rental income $228,806 per annum Lease is up to May 21, 2018 plus another 5 years lease option.